Alice Marshall is an International Yoga Teacher. Her studies have taken her to the Bahamas, India, Thailand, Bali, Spain, Marakech and Sacramento California. She has lived in the Sivananda Ashram in the Bahamas as a senior member of staff. She has continued on her path, in India, for several deep and full yogic immersions. 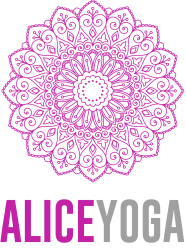 Her unique fusion of classical Hatha Yoga balanced with Vinyasa Flow and Yin enables Alice to create a sense of play and diversity in her teachings. Her passion for Yoga & teaching is infectious in her classes, she creates a safe space for her students to be able to grow and flourish, not only on the mat of yoga, but also on the mat of life. She has been practising and teaching since 2007. In the words of her Guru, Sri Swami Sivananda “An ounce of practice is worth tons of theory”. Yoga is the process of listening, growing and embracing the essence of your spirit. Every day we should practise - meditation, chanting, asana. Even if you only have 15 minutes make sure you find time to sit with yourself, breathe quietly and just be. Yoga is not just about being flexible, it is a lifelong journey, a path which gives us everything we need to find the peace that we are seeking, a path along which we will find the absolute truth, for it is right there in front of us.